Hi Bellas, let me introduce you to my little Bella. 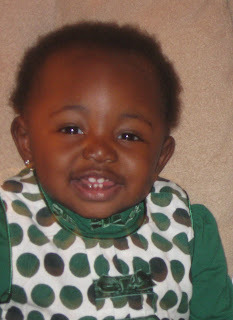 She is only 14 months old and she is already on her natural hair journey. I could not really do much with her hair as her hair was so soft. So Her routine was limited to every other day shampoo and conditioning. Her hair was oiled every day with Burt Bee's Apricot oil, between the age of 0 to 6 months. Even at 1 yr old, her hair was still very thin and hard to twist. She wore her little afro for the first year of her life. I actually now believe that it is best to leave their hair alone when they are so young. 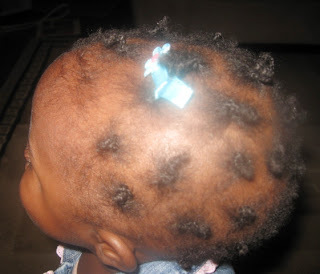 All that pulling, trying to twist and use hair accessories can be traumatizing for their tender scalp anyway. At 14 month, her hair has gotten thicker. Therefore, I am able to braid her hair. I would love to twist it but her hair is too fine and cannot hold twists for more that 48 hrs. The braids last for a week and can even last longer if I let it. Oooh, your daughter is soooo beautiful, what an adorable little girl. She so sweet. I love what you do with her hair, she's very blessed to have a Momma who's going to take good care of her hair and help her feel great about how lovely it is.